Just this week I learned about a CD that was released in Australia in the early 1990s that I’d never heard of before. 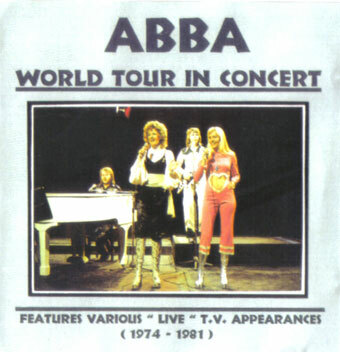 ABBA World Tour In Concert is an unofficial CD containing a selection of songs from television performances. Due to a loophole in Australian copyright law at the time unpublished live recordings could be released without permission of the artist or copyright holder. There were dozens if not hundreds of titles available for a few years. Most contained recordings from concerts taped by an audience member, but there were also some recorded from television performances or concert broadcasts. Most sold for just AU$5 at a time when a regular CD cost $25. Eventually the loophole was closed and the CDs disappeared from sale overnight. Today they are hard to find and rarely appear for sale second hand. Thanks to Trudy Wilkie @ ABBA Village for the information and the picture. Just 24 hours ago the new Benny Andersson Band song ‘Story Of A Heart’ had its world premiere on BBC Radio 2. ‘Story Of A Heart’ features music by Benny Andersson and lyrics by Björn Ulvaeus, which has instantly attracted worldwide attention as a new song by the ABBA songwriting team. The song is now available to listen online and ABBA fans everywhere have been commenting. Many have made comparisons to past B&B productions – that it sounds like ABBA, Gemini, Josefin Nilsson, even a song from Chess. But in truth of course it sounds like all of those. Or more accurately, ‘Story Of A Heart’ and all the songs by those various acts sound like Benny Andersson songs. Benny has a distinctive style that has asserted itself going right back to ‘Sunny Girl’ by the Hep Stars in 1965. Almost immediately a Benny Andersson composition sounds like a Benny Andersson composition. And that’s why when Benny still performs today he’s just as likely to play an ABBA hit as one of the folkish tunes he’s written for BAO – to him it’s they’re not ABBA songs or Hep Stars songs or BAO songs, they are all music that he has written. Listen to ‘Story Of A Heart’ and leave your comments at icethesite. To commemorate the 35th anniversary of ABBA’s Eurovision Song Contest win with ‘Waterloo’, albeit a month after the anniversary but coinciding with this year’s competition, ABBA The Official Site is poling for the “Best ABBA Song Ever”. Voting is open now until May 18. All voters are eligible to win ABBA merchandise prizes including a new limited edition ABBA necklace. Why does Benny restrict his audience? Fans trying to buy the legal download of the new Benny and Björn song ‘2nd Best To None’ from CDON or Bengans have been frustrated that it is only available to Swedish residents. It’s happened before that obtaining new material from Benny has been difficult for non-Swedes, despite his obvious international following. A couple of years ago Benny wrote a tune which was donated to the Red Cross and sold as a mobile phone ringtone. Like the ‘2nd Best To None’ download it was only available to Swedish customers. When the Swedish production of CHESS was filmed and released on DVD in 2003 the DVD was available to a worldwide audience of ABBA and CHESS fans and musical lovers, but had no subtitles in any language, making it hard for non-Swedish speakers to understand, especially the documentary feature on the second disc. Apprently ‘2nd Best To None’ will be made available on CD single. And the international CD ‘Story Of A Heart’, with English-language songs and previously released instrumental tracks will be released on 6 July. So it’s not all bad new for those of us outside Sweden. A brand new song written by Benny and Björn had its debut today on the newly updated website for Benny’s Hotel Rival in Stockholm. ‘2nd Best To None’ is sung by “The Rivals”, the staff of the Rival Hotel. With music by Benny and lyrics by Björn the song sounds like a cousin of ABBA’s 1982 recordings ‘I Am The City’, ‘Under Attack’ and ‘You Owe Me One’ with the female choir sound of ‘Klinga mina klockor’ and even a hint of Benny’s infamous birdsong album Fågelsång i Sverige. I’m excited that in a little over three weeks I’ll be staying at the Rival and will hopefully be treated “2nd to none”! See the clip now at rival.se. Keep an eye out for Benny, in the grey jacket towards the back of the crowd on the stage. ‘2nd Best To None’ is available to download at CDON or Bengans (available only to some territories). Word has it that a CD single will be available soon.